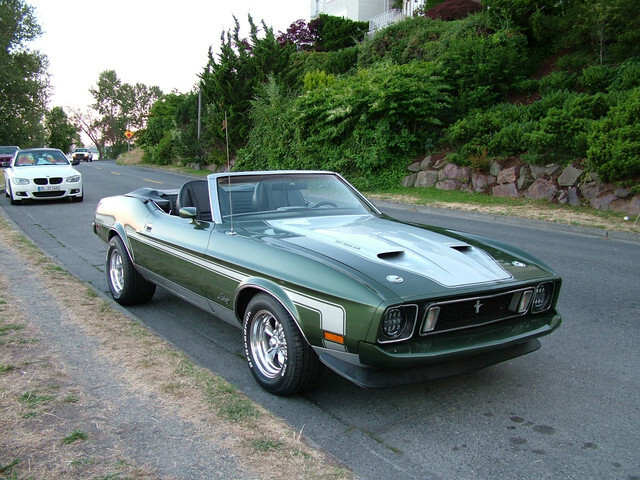 I'm looking for some suggestions at wheel sizes and proper backspacing for a 72 Mach1. I have original Magnum500s that needs to be cleaned up. So torq-thrust wheels looks like a great set for mach1 to ride on while magnum500s are off. If you're going for a stock-ish look, I think that 15x8" rims with a 235/60-15s would foot the bill. But if you're going for a hotrod look, I would recommend 295/50-15s on 10" wide rims in the rear with 5" backspace, and 235/60-15s with 8" rims in front with zero offset. Here's a recent picture of my vert with the latter set up.